The Oklahoma House gallery was packed on Nov. 8, 2017, as representatives spent hours discussing and debating a tax package to address the state's severe budget shortfall. That measure fell short. In the end, the backing of more than 45 health-care, education and public-policy advocacy groups – along with the support of a bipartisan group of current and former state leaders – wasn’t enough Wednesday. 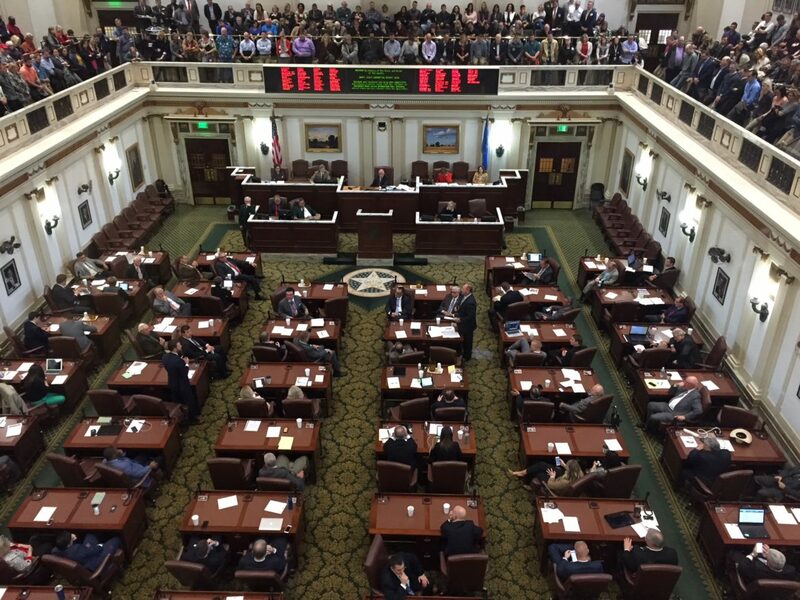 After four hours of debate and vote wrangling, the Oklahoma House came up five votes shy of passing a tax package expected to yield hundreds of millions of dollars – a bill that could have closed the curtains on a roiling special session without the need for painful budget cuts. The proposal to increase taxes on motor fuel, tobacco products, low-point beer and oil and gas production was one of Oklahoma’s most consequential and closely watched votes in years. Its passage would have put a major dent in the state’s budget problems by generating more than $130 million for the fiscal year that ends June 30 and $441 million next year. It also would have led to the likely passage of bills giving teachers and state employees a raise and restored a cut to the earned income-tax credit. But its failure means the special session, which now is in its seventh week, will continue without a clear end. GOP leaders say they will now shift to a Plan B scenario that calls for tens of millions in budget cuts and the use of one-time revenues. But it’s uncertain how that will shake out. The defeat of the tax package also means several groups stand to win or lose as a result of the Legislature’s action. Next year, Oklahoma teachers could have reason to commemorate an anniversary: It will have been 10 years since they received an across-the-board pay raise. During the past two legislative sessions, state leaders assured educators that a salary hike was almost a cinch. But on Wednesday, teachers’ hopes were dashed again, leaving many angry, even bitter, if social media is an indicator. Exactly a year ago, voters rejected a state question that would have imposed a penny-on-the-dollar sales tax to fund a teacher pay increase. “Today’s defeat of HB 1054x is a huge blow for Oklahoma’s dedicated teachers, public servants and the citizens of our state. It is an understatement to say we are disappointed,” said Pam Deering, executive director of the Cooperative Council for Oklahoma School Administration. The revenue package included a $3,000 salary increase and was endorsed by state Superintendent of Public Instruction Joy Hofmeister, superintendents of the two largest school districts, and many education advocacy groups. Education advocates now wonder if the failure will drive more teachers out of state or the profession. ““The longer the teacher shortage crisis goes unanswered, the more devastating its effects will be. Our kids continue to pay the price,” Hofmeister said in a written statement. “Once again, political gamesmanship and partisan politics have won the day at the expense of Oklahoma children and families,” said Shawn Hime, executive director of the Oklahoma State School Boards Association. Health-care providers and patients across the state face the effects of an unknown amount of budget cuts. Unless the Legislature acts, the entire $215 million that was lost when the Oklahoma Supreme Court overturned a cigarette fee passed earlier this year would fall on the Oklahoma Health Care Authority, the Department of Mental Health and Substance Abuse Services and the Department of Human Services. Health officials and advocates say the loss of funding for these services would be catastrophic for thousands who rely on state-funded services. GOP leaders have already moved to secure $23 million in rainy day funds for mental health, and lawmakers have vowed to find more money and spread out cuts among other agencies to minimize the harm these three agencies will see. But Senate Pro Tempore Mike Schulz, R-Altus, said Wednesday’s vote means “cuts to mental health and other services will be much more severe” than lawmakers had planned. The amount of cuts remains unknown. But health-care groups are already planning for worst-case scenarios. Republicans and Democrats have sparred frequently this special session as both parties accused each other of blocking budget agreements. House Speaker Charles McCall, R-Atoka, put the blame on Democrats for failing to bring 75 percent of their caucus to support earlier proposals. But this time it was Republicans who lagged Democrats in the share of members voting to approve the latest revenue-raising proposal. House Bill 1054 failed 71-28 – short of the 76 votes that represent required three-fourths of the 101-member House. Of that amount, 48 of the 70 Republicans present, or 68.5 percent, voted for the bill and 23 of the 28 Democrats, or 82 percent, voted for it. The defeat also threw into sharp relief the divide within the Republican Party. The 22 GOP lawmakers who voted against it defied calls to approve the measure from Gov. Mary Fallin and GOP leaders in the House and Senate. Rep. Leslie Osborn, R-Mustang, went as far as to say during floor debate that those who voted against the proposal, including members of her own party, deserve to be voted out. Beyond Wednesday’s vote, anger at Democrats remained over the protracted impasse of the special session. McCall and other GOP leaders have accused Democratic leaders of being obstructionist, suggesting the stalemate could have been resolved long before Wednesday’s vote. Democrats said their stance was a principled one against an overly regressive tax plan. Former House Minority Speaker Scott Inman – who a few weeks ago quit that role, said he will resign in early January and vanished from the Capitol – suddenly appeared Wednesday, voted no and left. Holding signs and wearing stickers, scores of energy industry employees crowded the Capitol rotunda before the bill’s presentation. Several made their way inside the House gallery for the debate and vote. The Oklahoma Independent Petroleum Association issued a legislative alert to its members, with employees from Continental Resources, JMA Energy and Templar Energy among those heeding the call. Scores of employees of oil and gas companies gathered in the Capitol rotunda to express their opposition to raising the gross production tax. Employees of oil and gas companies waited in the rotunda before the Oklahoma House began meeting to debate and vote on a tax package proposing to hike the gross production tax from 2 percent to 4 percent. Tim Wigley, OIPA president, said the average member company at his organization has about 11 employees. He said raising the gross production tax rate jeopardizes investment and future drilling activity. Wigley said his members are frustrated with the uncertainty on oil and gas tax rates. Tobacco companies and their lobbyists at the State Capitol also breathed a sigh of relief after the vote. The failure was the latest defeat within the past few years of a bill that includes a $1.50-per-pack cigarette tax. The idea to increase cigarette taxes has been popular with lawmakers from both parties, and it has been one of the tax increase proposals that polled well with voters. But the proposal was barely mentioned during the four hours of floor debate as other parts of the bill and the broader political discussions took center stage. The end result is that without any overt lobbying or public advocacy, cigarette companies and retailers that oppose the tax once again came out unscathed. Republicans who believe Oklahoma has a spending problem instead of a revenue problem also could chalk up a victory. Many of the 23 GOP lawmakers who voted no said their reasons were simple: Their constituents don’t want to see higher taxes. Rep. Kevin Calvey, R-Oklahoma City, one of the most vocal members of this group, repeated his call that the state needs to audit agencies and look for “efficiencies” instead of looking at tax increases. “We need to drain the swamp,” he said, echoing the familiar slogan used by President Donald Trump during his campaign. After the vote, Majority Floor Leader Jon Echols, R-Oklahoma City, who voted for the bill, defended the votes of GOP members who voted against it by saying they “have a true belief” that tax increases aren’t the answer. He added that the demand of these Republicans to audit state spending and find cuts will be will be part of the next steps the Legislature makes.